It's not easy being a super hero. No rest from the wicked. This prompts Tony Stark (Iron Man / Robert Downey Jr) to consider the redeployment of a dormant peacekeeping program called Ultron. The other Avengers disagree with his plan, concerned that Stark is experimenting with technology that he doesn't fully understand. 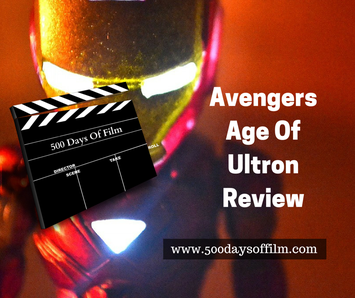 Stark moves forward with his plan and, with the help of Bruce Banner (Mark Rufalo), Ultron is born. However, the Avengers soon face significant parenting issues as Ultron (James Spader) starts to exhibit a monstrous mind of his own. Don't Miss Another Super Hero Review! Click Here! I have confessed this before but will mention it again - Marvel films are a guilty pleasure of mine. It is also lovely to go to the cinema with my son - both of us equally equally excited about the action adventure ahead. I thoroughly enjoyed Avengers: Age Of Ultron. It delivers plenty of action and adventure and it is always exciting to see a group of super heroes on screen together. For me, the dynamic between the characters (often displaying a humorous battle of egos) is what I enjoy the most. Ultron takes care to develop its key players and gives us interesting new insights into their past lives. The backstory concerning Scarlet Johansson's Black Widow is particularly poignant. The film also seeks to develop a new found intimacy between Black Widow and The Hulk. I wasn't sure how I felt about this plot line. On the one hand it makes sense but, on the other, it dilutes her relationship with Jeremy Renner's Hawkeye - something I have enjoyed in the past. Meanwhile, I love Paul Bettany's character development in this movie (as Vision) and really look forward to seeing more of him in future films. We are also introduced to two new characters in Age Of Ultron - Wanda Maximoff (Elizabeth Olson) and Sam Taylor-Johnson's Quick Silver. I enjoyed both but they did also present a problem for me. The problem is this - the film has so many characters and we want to know the status of each hero. I just felt that the film started to struggle to achieve this and the cuts back and forth did start to give me whiplash. Despite this, Avengers: Age Of Ultron is great fun, packed with exciting action set pieces and brilliant characters. I did enjoy James Spader's Ultron. I just feel that as Marvel baddies go, you can't beat Loki! Have you seen Avengers Age Of Ultron? Do you, like me, love the Marvel universe? Whatever your opinion, let me know in the comments section below! Avengers Age Of Ultron is out on DVD on 14 September.